This is a great fall dinner. It is perfect for a chilly night and it can be deliciously paired with a spicy pumpkin ale. 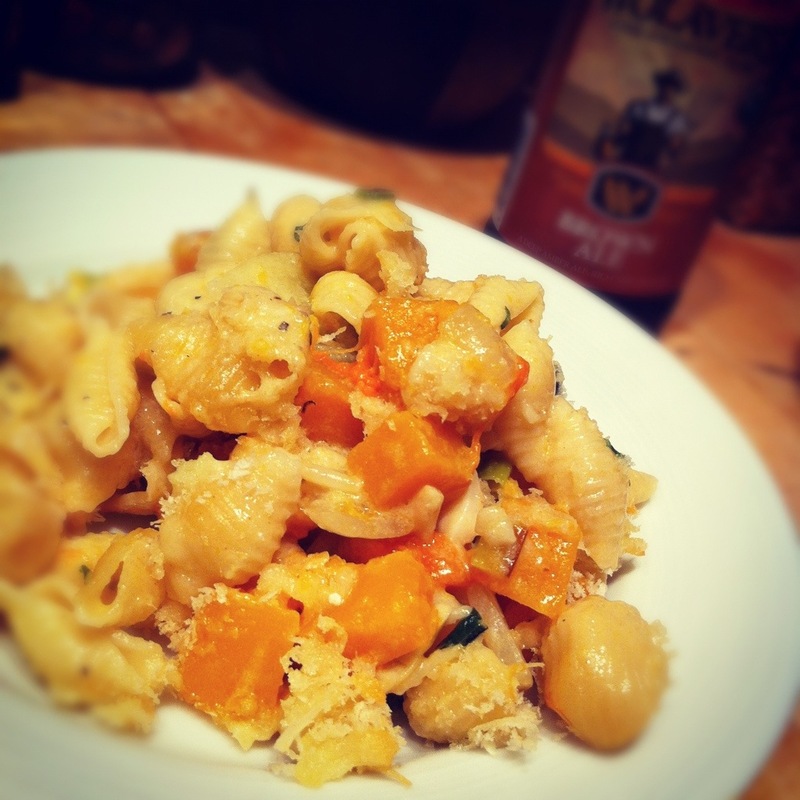 Clean and cut the butternut squash into smaller chunks, about the same size as the pasta you chose to use. Saute the squash, onion and half the garlic in 1 tbsp. butter. Cook until the squash is close to being soft all the way through – check it by sticking a fork through it. Meanwhile, cook your pasta to al dente according to the package directions. Save some of the pasta water to thin out your sauce in case it gets too thick. Saute the leeks and the other half of the garlic in 3 tbsp. of butter until tender. Add in the flour and whisk in until smooth. Add in half the chicken stock, whisk until smooth again. Warm the milk (in the microwave or on the stove) and add it into the sauce, whisk until creamy. Let the sauce cook down until it is a little thick – keep whisking it so the bottom doesn’t burn. When the sauce thickens add in the cheddar and Gruyere cheese and whisk until all the cheese is melted. Mix the sauce, cooked pasta, basil and squash mixture together. If the sauce is too thick, thin it out with a little bit of pasta water. Pour it all into a buttered 9×13 inch baking dish. Make a mixture of 2 tbsp butter cut into small pieces, the Panko breadcrumbs and the parmesan cheese. Mix it with your finger tips to separate the butter. Sprinkle it on top of the pasta and bake in the over at 350 degrees for about 20 minutes, or until your breadcrumbs look toasted. For all you bacon lovers out there – try adding some bacon crumbles to the top before you bake it…. mmmm!